On Wednesday, October 15th, the Center for Disabilities Studies at the University of Delaware – in cooperation with the Delaware Departments of Health an Social Services, Education, and Vocational Rehabilitation – hosted a Disability Mentoring Day. Liz Weintraub, a policy staff from AUCD, gave the keynote address, speaking about her experiences in job-seeking and how she found her jobs though networking. She told the audience of students with disabilities, “don’t settle for just any job, just because you have a disability. Find a job that you are happy in.” After Liz spoke, the students had opportunity to job shadow at different locations in the community of Newark, Delaware, to see what kind of jobs they might like to have. Watch this video about Disability Mentoring Day here. At the end of the day, students and mentors gathered again to hear Governor Markel speak about the power of believing in people with disabilities. “Our expectation for young people with disabilities is that they get job exploration experiences like Disability Mentoring Day,” Gov. Markell said. “We know that young people who participate in such transition services are more engaged in planning their careers and will be ready for the world of work.” Watch a Q&A with Governor Markell. Disability Mentoring Day is a project created by the American Association of People with Disabilities and hosted by organizations across the country. WorkSupport.com is a web portal from Virginia Commonwealth University that highlights and compiles the research and resources from projects across the university related to employment for people with disabilities. This includes the Rehabilitation Research and Training Center on Employment of People with Physical Disabilities, Autism Center for Excellence, Collaborative Career Planning for Students with ASD, and the Center on Transition to Employment for Youth with Disabilities. It includes video content and continuing education, like the video below about how to implement fading job place supports. Virginia Commonwealth University Partnership for People with Disabilities is part of the national network of University Centers for Excellence in Developmental Disabilities supported by AUCD. On May 29, Alaska Governor Sean Parnell signed legislation to make Alaska an “Employment First” state and ensure that state agencies and school districts prioritize employment as a first option for individuals with disabilities. Learn more on the Alaska.gov announcement. 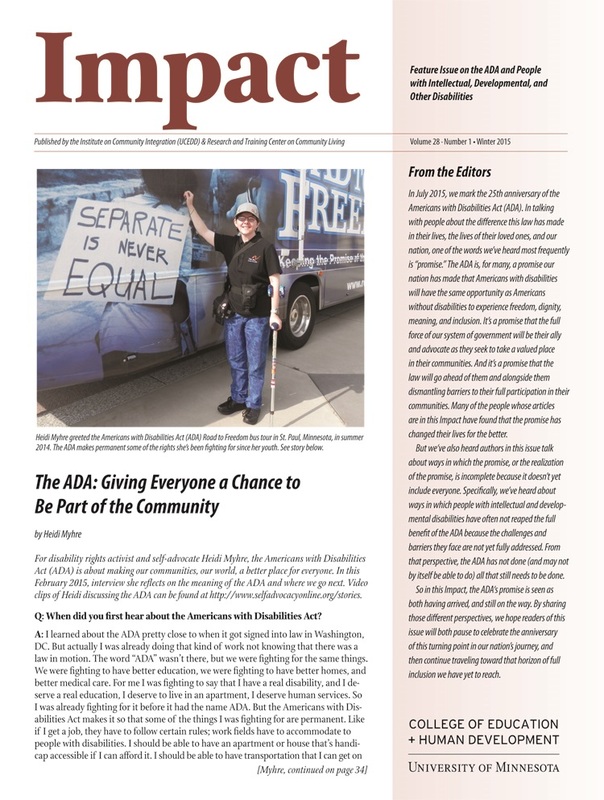 Across the nation, AUCD network members are implementing programs or conducting research to improve transition outcomes for youth with disabilities. Here are a few examples from around the nation. Central Indiana’s Franklin College is welcoming five high school students with intellectual disabilities to its campus this semester, thanks in part to a grant from Indiana University’s Institute on Disability and Community. The institute, a partner in the Indiana Postsecondary Education Coalition, creates programs on Indiana campuses that give students with intellectual disabilities a chance to participate in college life and obtain hands-on work experience before they begin applying for jobs in their communities. This month, students participating in Franklin’s new INSPIRE program took part in a meet-and-greet activity on campus that served to formally introduce INSPIRE — which stands for Individual Needs in Special Places to Increase Relevant Work Experience — to Franklin College faculty, staff and fellow students. “INSPIRE will help us get experience to get a job and help us take care of ourselves for the rest of our lives,” said Richie Olopade, a student from Center Grove High School. The Oregon Health and Sciences University Center for Excellence in Developmental Disabilities has launched a fully inclusive theater company as part of Emerging Leaders Northwest. Emerging Leaders Players (ELP) is the first fully inclusive West Coast-based theater group for youth and adolescents (ages 13-30) with and without disabilities that live in and nearby Portland, Oregon. Emerging Leaders Northwest (ELNW) offers community and web-based information, training and self-advocacy through its resource center and provides leadership skills for youth with disabilities. ELNW trainings and events focus on living a healthy lifestyle, having healthy relationships, graduating from high school and going on to college, standing up for your rights, living independently and getting a job. More than 1,000 youths with disabilities throughout Oregon have participated in training and events put on by ELNW since the program was founded in the fall of 2007. Training, Resources and Information for the Advancement of Disability (TRIAD) Service AmeriCorps is an inclusive service program through the Mississippi Commission for Volunteer Service. TRIAD Service AmeriCorps focuses on assisting students with disabilities in the transition to adulthood. This transition includes national service, employment, postsecondary education, adult healthcare services and more. Last spring, the TRIAD Service AmeriCorps project at the University of Southern Mississippi Institute for Disability Studies took on a project to help clean up their community after an F-4 tornado hi the Hattiesburg campus. The Path To Independence Project is a collaborative effort of the University of Nevada at Reno Center for Excellence in Disabilities (NCED), the University of Nevada Reno Extended Studies Department, the Bureau of Vocational Rehabilitation (BVR), and Sierra Regional Center (SRC). It is based on the national Think College model, which supports students with intellectual/developmental disabilities to have a college experience. It is a two-year, non-degree certificate program. The Path To Independence pilot project enrolled its first student at UNR in Fall 2013. During Year Two, Path To Independence staff will work with each student and their family to develop a customized employment vocational profile and plan. Students will develop a portfolio. Job developers will work in conjunction with BVR to find on- and off-campus internships and employment for students in areas of career interest. Competitive Employment is the expected outcome for each student. President Obama’s proposed fiscal year 2015 budget for the Department of Health and Human Services (HHS) proposes significant investments across the department to facilitate transitions to adulthood for vulnerable youth. Healthy Transitions. The Budget includes $20 million to continue the Substance Abuse and Mental Health Services Administration (SAMHSA) Healthy Transitions program to assist 16 to 25 year-olds with mental illnesses and their families in accessing and navigating behavioral health treatment systems. Psychosocial Interventions for Children in the Child Welfare System The budget proposes a new five-year demonstration project between ACF and CMS to provide evidence-based psychosocial interventions to children and youth in the foster care system to reduce the over-prescription of psychotropic medications and to improve outcomes for these youth. Over five years, this program would include $250 million from ACF and $500 million from CMS. The funding would build capacity in the child welfare workforce, provide reliable screening and assessment tools, enhance coordination between child welfare and Medicaid, and provide training for foster and adoptive parents, guardians, and judges.